With the opening of the 4-person gondola in 1970, Wallowa County added one of it’s most popular attractions. The 3700′ vertical ascent to the summit of Mt. Howard (8150') is a memorable experience. 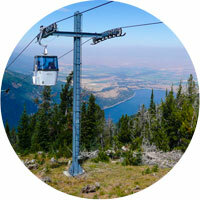 The exciting trip to the top of the mountain allows one to enjoy the 4000′ view as the gondola rises above Wallowa Lake Village and the blue waters of Wallowa Lake.